Thanks for the reply. Extremely glad this is still being updated and cant wait for the new update. Can you spill any details about the new update or is that a secret? Bloomin' great. With the proposed additions you mentioned, this will be awesome. Congratulations, this is a fantastic game. I like the simple controls. I hope you can add more features, while retaining the perfect simplicity of the controls. Brilliant. Yes, that will be the challenge, for sure - but I agree, simplicity is key! This is fantastic! I really love what you've done there. 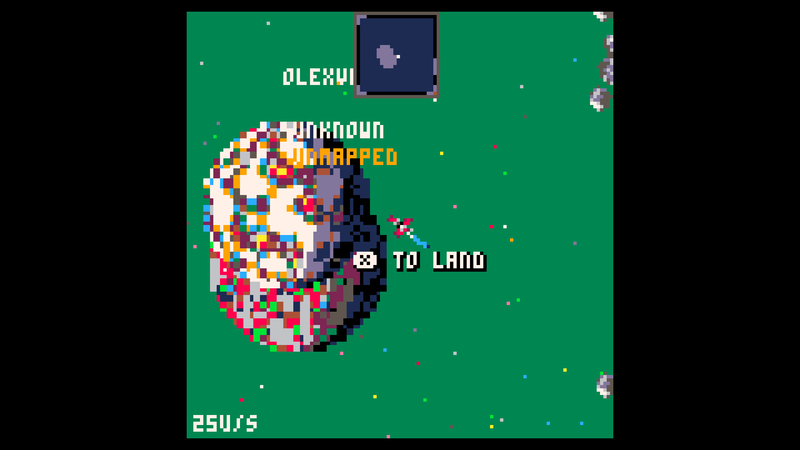 How did you manage to store all those cool planets in the very limited Pico-8 memory? Do you generate them with your algorithm when the game launch? Kind of - it's all generated on-the-fly (procedurally). - when you walk around the planet, new "areas" of the surface are generated. It's all down to using unique numbers to "seed" the random number generation. By seeding the RND() function, you will always get a consistently-random output. So, each system, planet, surface tile will always end up with the same seed (number). It's predictable, therefore you don't ever need to store it, just trust that it'll always come out the same. Thanks a lot for your answer! I'm definitely going to learn more about this. This is a great game and with a few updates it will be a favorite of mine. Will hostile spaceships be a thing, and how do you plan on making the plant material usable? Hopefully, yes, enemy ships (if time/cart space allows) will get added at some point, but my priority is more for planet-level AI for now. The plant material may change. They were added to be directly recognisable from NMS, but I think I'd prefer there to be less variety, and for each to have a specific "refill" purpose (e.g. refill health, oxygen, mining laser, weapon, etc.). Leaving the stuff you mine to be more for trading perhaps. Dunno. awesome. If I may, an interesting idea could be to use different plant material as special ammunition to use against the sentinels or native life. such as the frost crystal slowing/freezing them, or something like that. Im sure there's a better way to utilize it but i might as well suggest it. I would love a Galaxy s9+ background for this game!! So when people see my lock screen and ask about it I can tell them!!! Amazing game would love to see how far it will go! i've been considering buying No Man's Sky (in it's original form), and came across this. Thank you. Please continue to work on this. Well, while I understand it may not be everyone's cup of tea (or within everyone's budget) - if you liked any of my game, I *strongly* urge you to pick-up a copy (even 2nd-hand if you must), as there is SO MUCH more to explore there... especially since the "NEXT" update. I've been following No Man's Sky since before its launch, and was suprised with backlash with its launch, but I never could pick it up because I've always been an Xbox user. Now that it's on Xbox I am for sure going to purchase. Wow this is a great project. If you keep updating it to add the features you wanted to add plus farming, base building and fleets then this would be AMAZING and by far my favorite project! Like a 2D more simplified NMS. Havent seen gameplay on youtube yet but I bet all the NMS youtubers will eventually play it. Wish I could support but dont have the extra money but as soon as I do I will domate as much as I can. Alas, there is a very real limitation in the PICO-8 platform (which I very much agree with) which means that, alas, I'll never be able to go THAT far with it. However, if things work out - perhaps this game could find new life using a different engine, on different platforms. Time will tell - absolutely no promises. How much support would it take to get it that far? I would love to see this game become a 2D more simple NMS! It would be amazing. I can just imagine myself base building in 2D. Also thanks for responding. Not really down to support, really - mostly down to my available time and enthusiasm for the project. I really don't see base-building as possible in the available scope of this "Jam" game. Oh I see. Well if this does well, and you are motivated to keep updating it and still enjoy updating it, do you think transferring the game to another engine would allow you to add these more advanced features, base building, fleets, and farming? Sorry for kinda spamming you just interested. Thank you Andrew, I really appreciate your kind, encouraging words. The music is just *perfect* for that "I am alone in space" vibe. This game is so chill and nice. The music is nice and the vibe is so comfy. Thanks. I agree, something with cute graphics like that would be really cool. Who knows what the future brings, but either way - something like that would take a long time to create! I really like the game. The simple assets, the music, the generation of planets. It feels kind of like the actual game even though I haven't played the actual game. There are clearly some features missing from the game but thats ok. I'm just not really sure what I'm supposed to do in the game and what the things I pick up do or how I use them. I'm wondering if its even possible to beat the game and get to the center of the universe? Yeah, the plant resources are kinda pointless in this build (ran out of time). But the Warp Cells are important if you wanna travel to other systems. As for the game being beatable, who knows? But how do you get Warp Cells in game? You can find them dotted about in red containers/cargo drops on the planet surface. Great work! Loved just chilling out and exploring in my ship. The music pairs with the game really well. Excited to check in later and see where you've taken it! So currently, I assume you can't really do anything with any of the stuff you pick up? I was focusing more on making the procedural system/planet/surface generation, that time got away from me. Hahaha! I think you focused on exactly the right things for now. Thanks bud - you are the King of Play-Testers! AWESOME!!! I'm gonna have to take my laptop on holiday now just so I can play this!!!!!! Yay! You're my hero! You know, I'm sat here alone drinking Jack Daniels and coke. I've had a little play and the music at this point in time is so chilling. I'll post a video later though.